Born: November 1825 in Harwich Ma. 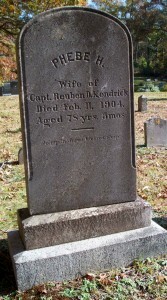 Died: February 17, 1904 in Bourne Ma. at 78 yrs, 5 mos. 1. George A. Kendrick; (September 29, 1846 – April 2, 1927); Married Lucy Ellen Gibbs (1850 – 1913) (Ezra Gibbs & Ellen Henley) in Sandwich Ma. 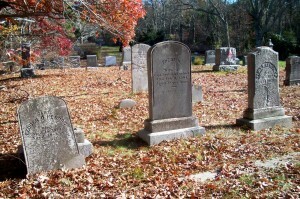 on November 14, 1869; George, Lucy & their son Pliny T. are buried together in Pocasset Cemetery. 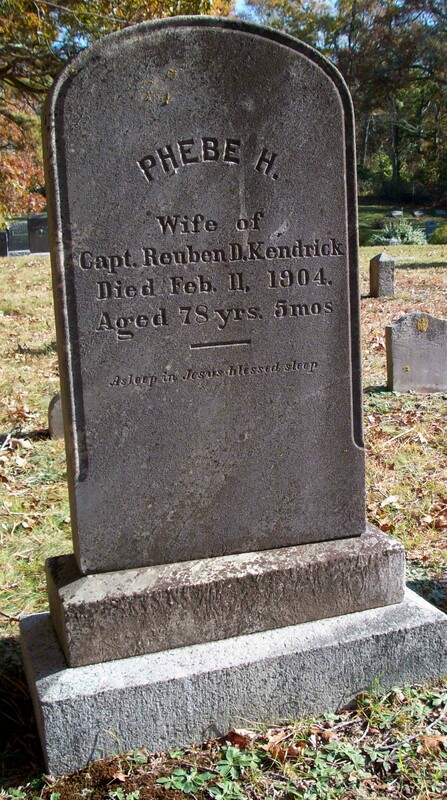 2, Pliny S. Kendrick; (September 11, 1848 – August 2, 1873); Pliny S. died at 24 yrs, 10 mos. & was unmarried; He is buried in Pocasset Cemetery. To: Josiah Godfrey, Jr. Capt. ; (1821 – 1899) (Josiah Godfrey, Capt. & Mary/Polly Wing); Josiah, Jr. married (1) Abby Dimmick (1825 – 1877) (David Dimmick, Jr. & Esther D. Wing) in int. November 13, 1843.